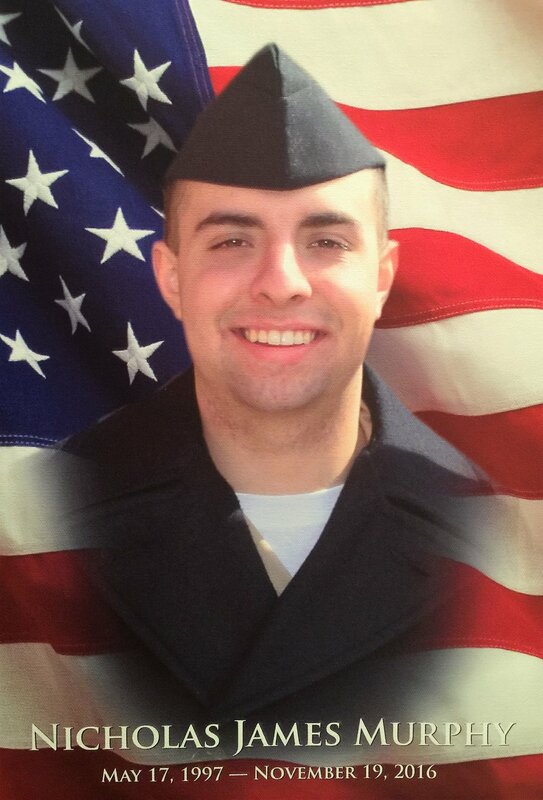 One of the purposes of the Nicholas J. Murphy Foundation is to provide financial support, grants and scholarships to individuals and families associated with the the Armed Forces, with a special emphasis on the United States Navy and special forces, all in honor of our son and brother, Nicholas James Murphy, a member of the United States Navy killed on November 19, 2016. We are still looking for more young men and young women who are joining or have joined the military and are waiting to go to boot camp. The Nicholas J. Murphy Foundation gives out $1,000.00 military scholarships to deserving young men and young women who meet these criteria. We will give special consideration to anyone who has a special forces contract, like Nick Murphy did for the Navy SEALS. If you know of anyone locally who has joined the Armed Forces and who is in need of a military grant and scholarship to help them out before starting boot camp, please contact us. This money can be used for any reason, including family and support, a vacation before joining, to help pay bills, etc. We know the military does not pay well and we want to help out these outstanding young persons and thank them for their sacrifice and commitment, now and in the future. In addition, as part of our “Pay It Forward” goal, we want to help in the financial support for families of the Armed Forces. In 2016, for Christmas, we gave out six $300.00 Christmas grants (a total of $1,800.00 given out) to deserving military families throughout the United States to help them out this Christmas season. We thank all of these families for all that they do to protect and serve for us and their service to our Country. For Christmas 2017, we gave out ten $500.00 military Christmas grants (a total of $10,000.00 given out) to deserving families. We are now collecting donations and wil be giving out Military Christmas Grants for 2018. To learn more and apply, click here. The Murphy Family and the Nicholas J. Murphy Foundation are very happy we are able to help them all out this Christmas and holiday season. In addition, we recently gave a military grant to a local family in the sum of $1,625.00 to help them keep their home from foreclosure. The father was a decorated military veteran who served three separate terms of duty over a 15 year time period and was now a disabled veteran trying to get by. We thank him and his family for their service and sacrifice and were extremely happy to help them out. As stated above, we will give out $1,000.00 military grants to deserving student-athletes from any high school or college in the central Illinois area that can be used by them for any reason. If you know of a deserving young man or woman who would be a good recipient, please email gedwardmurphy@nickmurphyfoundation.org. These military grants are to help these young men and women in their transition into military life, to go on a vacation with their family before they go off to boot camp or for whatever reason they deem worthy. Any young man or woman who has joined the Armed Forces in the Central Illinois area is eligible to apply or be nominated for these military grants. Please help support our military troops and specifically these brave young men and women sacrificing everything and going straight from high school or college into the Armed Forces by donating to the Nicholas J. Murphy Foundation. All donations, no matter how small, are welcome and appreciated and make a huge difference in making these military grants possible. If you, your company or your organization is interested in joining us or partnering with us on this endeavor, please let us know. Nick Murphy loved playing baseball from the time he was five years old through high school. He also loved his time in the Navy working to become a Navy SEAL and his years prior to joining the Navy training to become a Navy SEAL. These military grants and the financial support we provide for deserving military individuals and families joining the Armed Forces are a big part of the Nicholas J. Murphy Foundation. Please support our military and make a point to thank them every chance you get for their service, sacrifice and commitment to our country every time you see a member out in public. I can tell you from experience in talking with Nick that it means a lot. You can reach out by emailing G. Edward Murphy, by calling (309) 674-5593 for the Nicholas J. Murphy Foundation, or by donating through the link below.